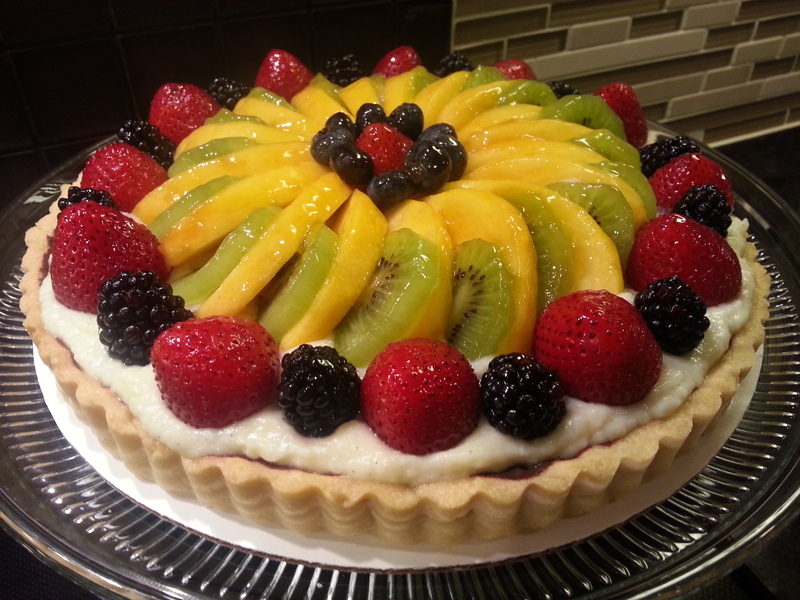 I love fruit tarts, its well worth the time to get that perfect look and taste. It is so refreshing when it is well chilled. Ready? The instructions is long …. Wait Time: 3 hours for the tart dough, and more time for chilling the tart. Combine butter, sugar, and salt in a standing mixer fitted with the paddle attachment. Beat at medium speed until smooth. Mix in eggs, one at a time, mix until smooth. Add the flour all at once, and mix on low speed until dough clumps around the paddle. Remove the dough onto a lightly floured work surface. For my 10″ tart shell, I divide the dough into 2 equal balls. Shape each ball into a disk 1/2″ thick, wrap in plastic wrap and chill for 3 hours. Note: Only 1 disk is needed for the fruit tart. Freeze the other disk for the next fruit tart; makes it a lot easier the next time. To use frozen tart dough, de-freeze it in the refrigerator overnight. Prepare a large piece of parchment paper (at least 2 inches larger than the tart pan), lightly dust the paper with flour. Unwrap the dough disk and place it in the center of the dusted parchment paper. Dust the top of the dough lightly with flour, and cover with another piece of parchment paper of the same size. Roll our the disk in between the two pieces of parchment paper to a circle 2 inches larger than the tart pan. Note: Roll from the center to the edge, flip the dough over and carefully remove the parchment paper after every few strokes and lightly dust with flour before replacing the parchment paper and roll again. Repeat rolling, flipping, and dusting with flour until the dough is a circle of the desired size. If the dough becomes too soft and starts to stick to the parchment paper, chill the dough again in between the parchment paper in the refrigerator until firm enough to handle. With the dough at 2 inches larger than the tart pan and firm, carefully remove the parchment paper on top and bottom. To ease transfer to the tart pan, gently fold the dough in half and then a quarter, do not press into the dough. Transfer to the tart pan and unfold; ease the dough into the bottom and sides of the pan and press gently into place. Do not stretch the dough or the sides will shrink during baking. Run the rolling pin over the edge of the tart pan to remove excess dough. Place the pastry shell in the refrigerator or freezer until the dough is firm, about 15 min. Prick the bottom of the dough with a fork. Place the tart pan on a larger pan in the center rack of the oven and bake at 400 degree for 5 minutes. Reduce to 350 and bake for another 15 minutes, or until crust is dry and lightly golden brown. If you notice the bottom of the tart shell puffing up during baking, prick it with a fork to release the air. Cool completely on a wire rack before glazing the shell. When the shell is cooled, melt 3 oz of dark chocolate and spread it evenly across the bottom and sides of the tart using an offset spatula. Let the chocolate cool and harden before filling. Note: you can prepare the Tart Shell the night before and keep it well wrap in the refrigerator to make it easier on the day when you want to assemble the fruit tart. In a mixing bowl, whisk together the cornstarch and sugar, add eggs and whisk until smooth. Set aside. Pour milk into a heavy sauce pan. Split the vanilla bean lengthwise and use the tip of a sharp knife to scrape the seeds from the pod halves into the milk. Add salt and bring milk to just under a boil over medium-high heat, stirring occasionally. When the milk is ready, ladle one-third of the hot milk into the egg mixture, whisking constantly to prevent clumping. Pour the egg-milk mixture back into the hot milk and continue whisking over medium heat until the custard is as thick as lightly whipped cream. As the cornstarch cooks, the mixture will thicken. Do not let the mixture boil vigorously. Remove from heat and pour the mixture through a sieve sitting on the rim of a bowl for cooling the pastry cream. Cool for 10 minutes, stirring occasionally to release the heat and prevent a skin from forming on top. Whisk the butter, one table spoon at a time into the custard until completely melted and the mixture is smooth. Cover the bowl with a plastic wrap, pressing the wrap directly onto the top of the cream to prevent a skin from forming on the surface. Cool completely. When cooled, chill the pastry cream in the refrigerator. Again, I like to prepare the pastry cream the night before to ease assembly the next day. Wash and cut the fruits and gently pat dry with paper towel. Spoon the pastry cream into the tart shell, spread it evenly over the chocolate base using an offset spatula. Do not fill the shell to the top as the pastry cream may overflow when the fruits are added on top. Lay out the fruit on the pastry cream. Melt the apricot jam and sieve for the liquid glaze. Using a pastry brush, gently brush the warm glaze over the fruits. Chill the tart in the refrigerator until ready to serve.